I’ve been going through my schedule and I do have a lot of yummy, interesting and crafty posts in the pipeline, but for today here are a couple of projects that have been keeping me busy. It was recently my wedding anniversary which we’ve never really got around to celebrating. Year after year we promise to actually do something, but it never seems to happen. This time we both managed a card at least, so that’s a vast improvement. Anyway, at about 2pm on the day it suddenly struck me as a fantastic idea to recreate our wedding cake. 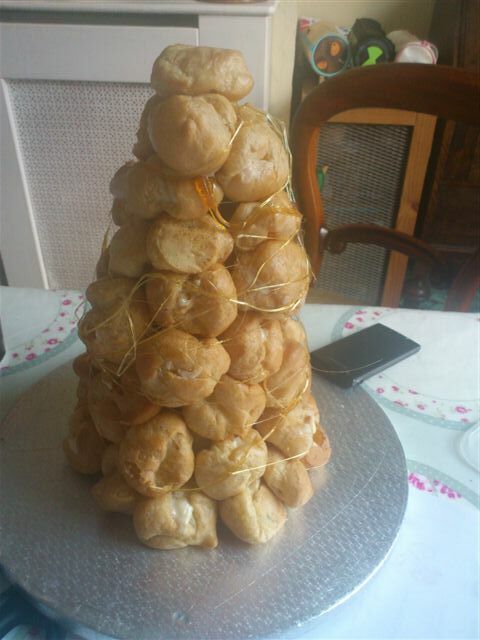 I had no idea what was in the cupboards, but I improvised my way through and made a croquembouche! With more time and preparation I like to think it would have looked a bit grander. Our actual wedding cake was significantly larger, filled with chocolate cake and obviously somewhat more professional. For my first croquembouche though, I think it’s pretty nifty 🙂 If you would like to have a go yourself I used the recipe from Lakeland Limited’s site. I sadly do not own their specially designed pan, I had to make do with a rather fiddly cardboard cone I constructed and covered in greaseproof paper. Overall I was very chuffed with this last minute effort. 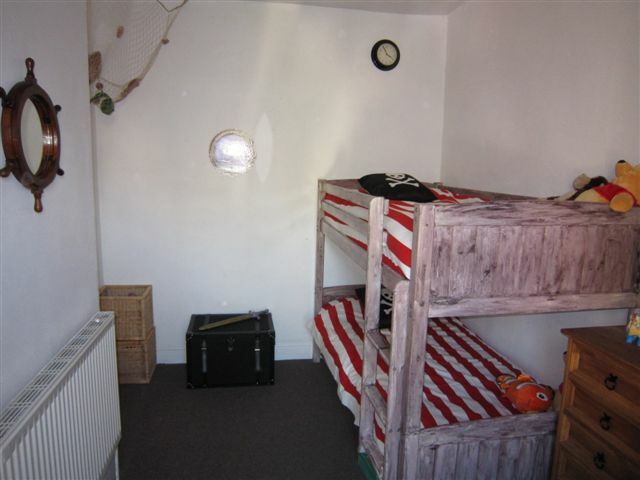 In other news we have been redesigning our boys bedroom. Having heard an awful lot about pirates recently, it became easy to choose a theme. I’ve tried to take a few photos to show you the finished product. 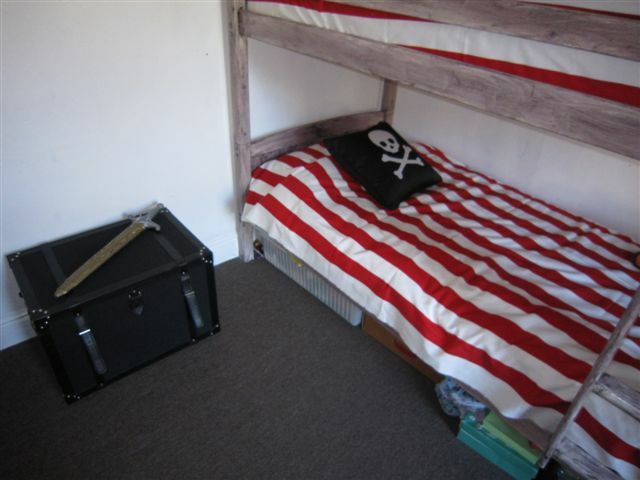 We painted the bunks (which were originally white) using a homemade chalk paint. This was largely due to impatience on my part, the original plan had been to purchase some wonderful Annie Sloan paint, but it worked so I’m not going to complain. If you’d like to have a go at making your own chalk paint, it’s roughly two parts emulsion to one part plaster of paris. I made the bed covers from wide stripe fabric. No fancy padding I’m afraid, they simply pull over the existing quilt. The cushions are premade faux silk ones from Dunelm Mill. I then cut up an old sheet and appliqued the skull and crossbones. The lampshade is a plain one from Ikea with gold braid glued in place (just realised this doesn’t feature in the photos but I swear it looks great lol). The clock and curtain fabric (which I forgot to photograph) are also from Ikea. The curtains are tied back using thick rope. We also have a jolly roger light switch cover. 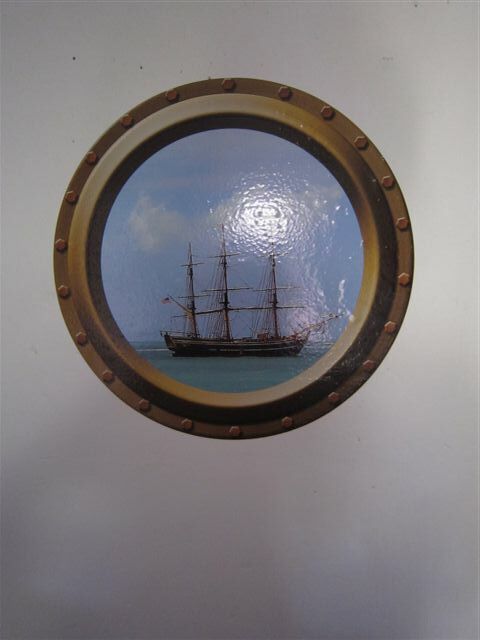 A bit of a search about the internet found this amazing porthole from Wilson Graphics, it’s wonderful! 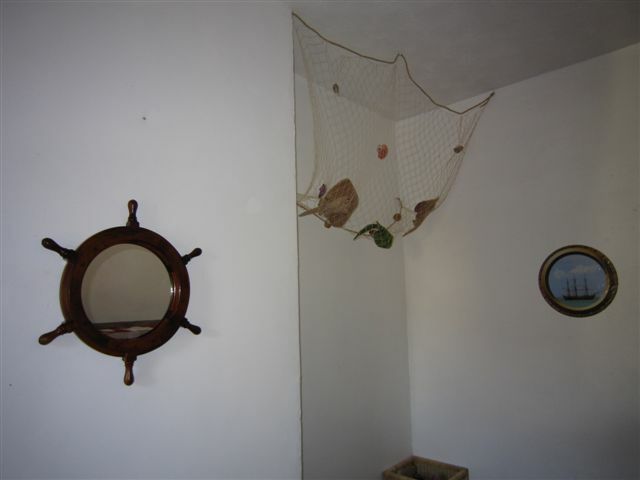 The ships wheel, toybox and fishing net were from various sellers. The shells were wound into place using beading thread. The boys love their new room and I’m pleased with it too. If you want to know where I got anything from just send me a message or leave a comment here.